Just a quick update, this tank has now been running for around 7+ months and the tank conditions are still stable, plants are growing well, the fishes and shrimps are healthy, algae is still minimal so its stayed relatively low maintenance so far. Due to the dense growth of plants, i found it difficult to feed the fishes and shrimps without food quickly disappearing into the plant mass (especially when feeding algae wafers)... so i recently installed a feeding dish to help contain the food in one convenient spot. I chose to use an acrylic dish with an attached feeding tube (those commonly used for shrimp tanks), but soon discovered that the curious Otocinclus Cocama like to swim into the tube and get stuck in it, so i removed the tube and just used the dish on its own. Are you able to share with me where you purchased that feeding dish and the price of it? I ordered it from eBay, cost around SGD$10+ for a set which includes the dish and feeding tube. 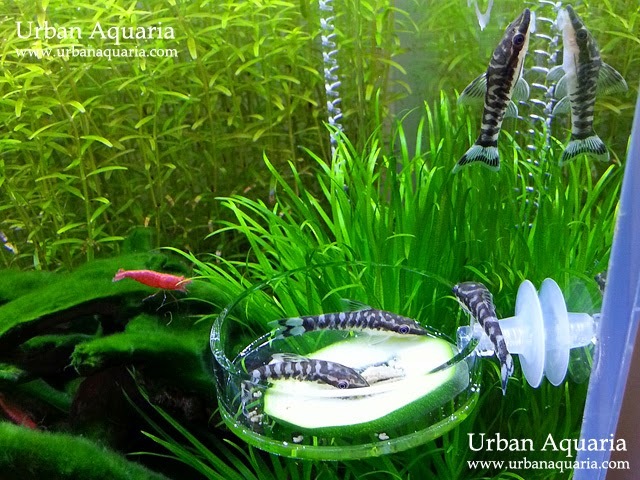 There are quite a good selection of various types available (depending on the dimensions), just search "acrylic shrimp feeding dish" on eBay and you should see all the listings. Incredible Blog !!! Absolutely amazing information. Was wondering what brand of Tanks you are using? hi nice dish there, was wondering if you could share how do you do it? i searched on ebay as per your suggestion but i couldn't find one that has a suction cup attached to it, are the suction cup separate? hope you can advice me either the reseller or how i can achieve this too, cheers! The suction cup i used came with the dish and tube set... instead of using the tube, i just DIY it by attaching the dish (it has an acrylic nut and bolt) directly into a matching suction cup. Low-iron glass tanks are made of glass with lower iron content, which enables them to be clearer with higher light transmission and better/more accurate color rendition when viewing. Normal glass tanks are made of glass with higher iron content, so they tend to have a greenish tint in the glass and are less clear.